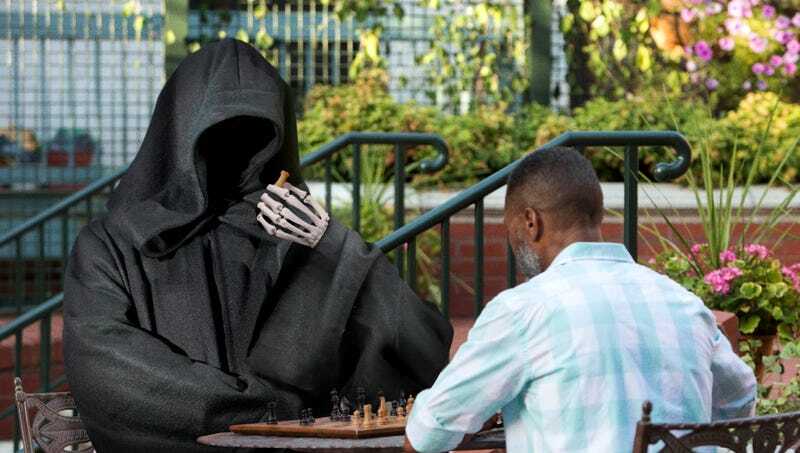 AUSTIN, TX—Shedding light on the dangers of challenging death, a new report published Friday found that the fastest-rising cause of death in the U.S. is losing a chess match to the Grim Reaper. “After examining recent mortality trends, we have found that the rate at which Americans are dying due to the Grim Reaper defeating them in a game of chess is quickly increasing,” said lead author Drew Campos, explaining that attempting to best the Grim Reaper at the board game on the rocky ocean shore was becoming exponentially more fatal with each passing year. “With this becoming an even greater issue as more people attempt to forestall their own demise by challenging the Reaper, it’s important to pay close attention to the early warning signs of botching one’s opening moves or losing a key bishop. Because by the time you’re led over the hills arm-in-arm in a dance of death, it’s already too late.” Campos also warned that although a small percentage of people end up checkmating death, the Grim Reaper would be back for them.